Have you ever been stunned speechless by the beauty of another? I have — whether from my niece’s wide, uninhibited smile spilling girlish giggles; from my daughter’s strong blue eyes gazing thoughtful; or from the 80-year-old swim teacher’s papery-skinned hand gripping the fingers of my delighted preschooler. If you’d ask either of my daughters Are you beautiful? I’m confident that both the 4-year-old and the 14-year-old would say Yes. Pressed as to why they are beautiful, each would tell you this: Because God made me. It’s a truth overlooked and even forgotten in a society that idolizes smooth skin and plump lips, thick lashes and thin hips — a truth that, if not intentionally taught, will be lost forever. And that’s the reason I think we need to be purposeful about not only telling our children they are beautiful, but also telling them why: they are beautiful simply because God made them. The Bible says beauty is fleeting (Proverbs 31:30), and evidence stares at me from the mirror: lines furrowing deeper on my brow; gray hair, unruly, slipping free from last month’s color treatment; shadows circling darker beneath eyes growing weak with age. That outward beauty fades surprises no one; that we allow mere humans to determine a person’s worth based on his or her ability (or lack thereof) to model an always-altering definition of attractiveness, however, is tragic. Especially when the truth is that every one of us was knit carefully together in our mother’s womb by the Creator of the universe, whose every work is nothing short of awesomely wonderful (Psalm 139: 13-4). The answer? It makes each and every one of us glorious! Glorious! And so let it be my responsibility and yours to tell every girl she is lovely — not based on the thickness of her waist or the contour of her cheekbones but because she was meticulously handcrafted by the King of Kings who knows the very number of hairs on her head (Matthew 10: 29-31). 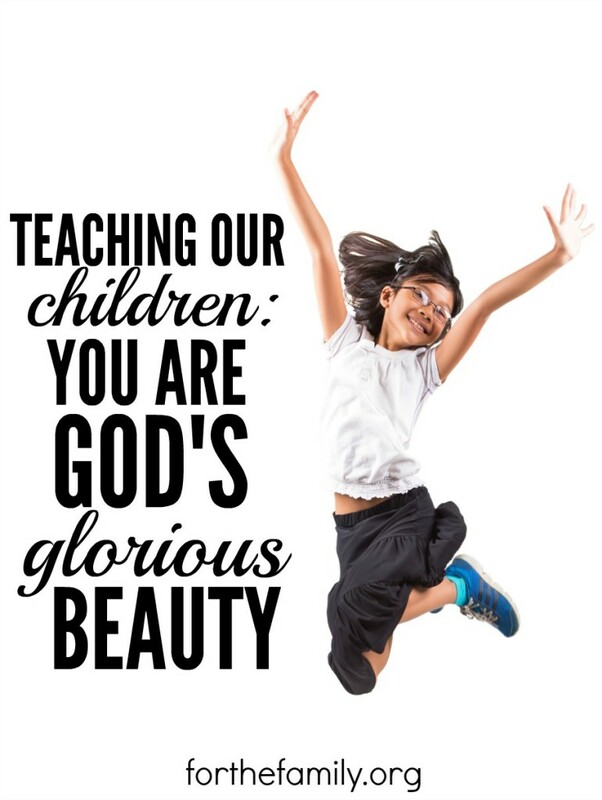 Let it be my responsibility and yours to assure all children that they are beautiful — not because of some arbitrary cultural definition of what is appealing and what’s not, but because the God who made everything and who made everything glorious, also made them. And let us demonstrate this truth to their watchful eyes by praising God even as our skin droops, our hair grays, and our bones weaken, with a deep understanding that we, too, are — and always will be — beautiful.